The majesty of physics - its fundamental rules that seek to describe our universe - is in itself awe-inspiring. If one doesn't see it that way, then the book presents what we know, and don't know, and may never know anytime soon, in such an unorthodox and witty way that can disarm even the staunch anti-pop-science/anti-physics mindset. Just one equation - one all-pervading, elegantly-compact equation - viz., E = mc2 is all that is presented in this book which discusses such profound topics as Time Travel, Quantum Particles, Expanding Universe, Alien (Intelligent) Life, Grand Unified Theory (GUT) and suchlike. With a direct and seemingly effortless manner, peppered with humorous analogies and footnotes that call upon pop-culture freely, the book addresses some of the profoundly confounding information many great minds have spent their lifetimes pondering on. Some areas that popular sci-fi shows have exploited well, and not-so-well, and why, is briefly discussed in the book, which is a wonderful way to connect the complex concepts with the simple everyday experience of laypeople's entertainment (assuming any of us watch those shows). The cartoons by Jeff Blomquist are mostly witty, but sometimes cheesy. They certainly make it easier to catch the complicated ideas being discussed, even if in a superficial sort of way - which is more than most physics books do to help understand such mind-boggling concepts. At the same time, the book also explains the things that seem impossible but aren't, along with the things that seem impossible and certainly are, unless we are willing to break some of the fundamental laws of physics. 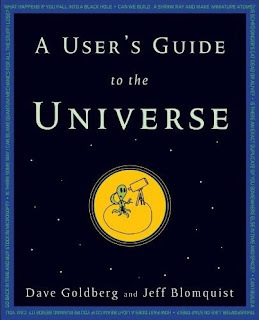 I've become a fan of the official A User's Guide To The Universe blog/site, maintained by Dr.Goldberg. Also, one of my oft-visited sites hosts Ask A Physicist column where readers are free to pose questions (hopefully meaningful ones in the interest of furthering our understanding) which, if reasonable, are answered by Dr. Goldberg himself. I still break out in cold sweat thinking about the second quantization and quantum field theory for many-particle systems, Tensor calculus and Minkowski metric and such from a previous lifetime as a grad student. Sheer reverence and curiosity, not to mention the mesmerizing Australian lilt of my professor, helped me get through the Advanced Quantum Mechanics course with very few bruises. I remember carrying the little pocket book of subatomic particles, courtesy of APS (when the dues were nominal for student members), and felt like I had some privileged information, dallying with quarks and leptons. And from all of that experience, it became clear to me that while the life-long fascination is hard to shake off, I can and must banish any thoughts of contributing anything much to my favorite areas of Physics. Having said that, it should be easy to see why this book was on my Must-Read List. And, having read it, I wish I had Dr.Goldberg as one of my teachers back in my starry-eyed student days. While I was awed by the authors' ability to take complex concepts, apply the known experimental and theoretical issues, and present it all in a conversational manner, I did find the footnotes a bit distracting, to put it mildly. There were too many of them, mostly pop-culture references which am not sure would be understood by international audience, even if they are entertaining and clever. I guess it is my tremendous respect for physicists that makes me protective of them, wanting them to be revered by all the world, not just in the U.S.
As the book points out, theories can't just advance an idea and leave it at that - they have to also set up possible ways to disprove these ideas so that it can stand the test of time. Your review popped up my google alerts this morning, and I must tell you that it's a great way to start the day. Thank you so much for your kind words. As for the footnotes, I suppose we'll have to agree to disagree. As a side note, we had the same concerns about appealing to an international audience, which makes it all the more confusing that we're now being translated into 4 other languages including Turkish. I have no idea how the puns and pop-culture references will translate. I hope you'll consider posing a question to the "Ask a Physicist" column so we can close any gaps. Thanks again! Thank you, Dr.Goldberg, I feel honored by your visit here! Please, call me Dave. One clarification is that both Jeff and I wrote the book. I just want to make sure that everyone gets due credit (or blame). Thanks for pointing that out, Dave, will edit the post to reflect this. Why do you want to banish thoughts of contributing to Physics ever? You can go back to it one day - it seems like something close to your heart and soul.